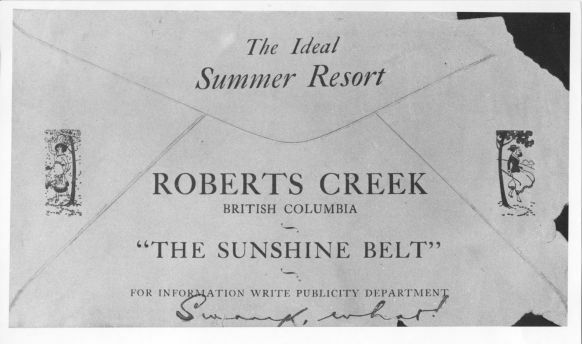 The Roberts Creek area was originally occupied by aboriginal people of the Coast Salish nation, specifically the shishalh tribe, from which the town of Sechelt took its name. The shishalh people referred to Roberts Creek ashwah-sam, meaning big, fat salmon. The mild climate and abundance of fresh water and natural food (fish, shellfish, salmonberries, huckleberries, blackberries, Oregon grape, fiddlehead ferns, stinging nettle, fireweed, rice root, tiger lily, etc.) made this area a favourite site, the first food-gathering location up-coast from the shishalh's southern boundary with the Squamish people at Chaster Creek. At four o'clock on Saturday morning the 16th, we resumed our course to the northwestward, along the starboard of continental shore of the gulf of Georgia, which from point Gower takes a direction about WNW and affords a more pleasing appearance than the shores of Howe's sound. This part of the coast is of a moderate height for some distance inland, and it frequently jets out into low sandy projecting points. The country in general produces forest trees in abundance, of some variety and magnitude; the pine is the most common, and the woods are little encumbered with bushes or trees of inferior growth. Roberts Creek's present name came from the first European settler to this area, Thomas William "Will" Roberts. In 1889, he staked out a quarter section of flat land just east of the creek. To earn his crown grant to the claim, he built two cedar shake cabins, a chicken house and stables and cleared three acres for cultivation and fruit trees. Will's mother and father, Thomas & Charlotte Roberts, arrived from England the following year and Will's brother, John Francis "Frank" Roberts, joined the family two years later. Frank built a large log house a quarter mile east of the creek for his parents. There were other pioneers in the Roberts Creek area in the late 1880s. William Campbell staked a long narrow waterfront property to the west of Roberts Creek, mostly for the timber. The northern half of his property is now the Sunshine Coast Golf & Country Club. James Grant claimed the piece to the west of Campbell, and James Ross staked next to him on a property bordering Flume Creek (today Marlene Road forms the eastern boundary of his land). Among the most successful early farmers in the Creek were John "Jack" and Gertrude Reeves. Jack cleared 12 acres of land for truck garden crops and raised pigs, chickens and geese for market. He sold his produce to the Indian residential school, resorts and summer homes in Sechelt. Gertrude Reeves had one of the first cars on the Coast, an electric affair she had shipped from England via Cape Horn. With fully-charged batteries, it could travel about 20 miles. Another colourful early Creeker was Hubert Evans, who left his comfortable position in the Vancouver media business to settle his family on an acre of waterfront at the mouth of Stephens Creek. He wrote stories for children's magazines, quitting each year once sales reached $2500 to cruise the coast with his family in a 28-foot boat. In 1897, Thomas & Charlotte Roberts retired to Vancouver and Frank moved into the log house he had built for them. Frank's married son, Francis Thomas "Tom" Roberts, and his family occupied the cabin built by Will. In 1903, Frank and another son Harry established a shingle bolt camp along the creek. Frank later sold the camp and the surrounding 40 acres east of the creek and took on the job of Roberts Creek's first postmaster. On mail days, he rowed an Indian dugout canoe into the bay to pick up mail from the Union Steamship Company's Comox. Harry Roberts was one of the most influential of the early Creek settlers. Formerly a painter, author and philosopher in England, he brought his visionary spirit to the Sunshine Coast. A multi-talented entrepreneur, he catered to summer travelers and local farmers by building a store near the mouth of the creek (near the current site of the Roberts Creek General Store). He also built a sawmill which provided lumber for most of the new houses in the area and for the government wharf, and timbers for the 13 bridges necessary to construct Lower Road. He was well-known for his unique house and boat designs - much of the lumber he produced was used in their construction. He also built and furnished small cottages to rent to vacationers and eventually subdivided as the demand for land grew. In 1923, Harry leased out his mill and store and moved with his family to Merry Island, then to a retirement home on Nelson Island in 1929. The house he built here, called Sunray, was a charming cottage with south-facing walls of glass. It still stands in its idyllic cove at Cape Cockburn. It was Harry who originated the term Sunshine Coast. He painted a huge sign, visible from the ocean, on the side of the steamer company's freight shed near his store proclaiming this area as the Sunshine Belt, later modified to the Sunshine Coast. The community of Roberts Creek was highly dependent on water transport for supplies, but developing a ship landing was made difficult by the harsh winter storms. Two floats constructed by the government were washed away, and for many years passengers and freight were rowed out to larger vessels in small boats or towed on barges. In 1914 a government wharf was finally completed. Frank and Dulcie Downes took over the Roberts Creek Store from Harry Roberts. They moved it closer to the wharf, enlarged and renovated it and added electricity, refrigeration and the community's first hand-operated, gravity-flow gasoline pump. Roberts Creek village at this time also boasted a second general store (opposite the present-day post office), a small summer resort, a beauty parlour, a shoe repair shop, a barber shop, a bakery, a service station and a cafe. There were also three summer camps nearby: The Kewpie Camp for girls, just east of the creek, the 200-acre Camp Byng for Boy Scouts on Lower Road (still in operation), and Camp Olave, a Girl Scout camp at the foot of Rat Portage Hill (also still in operation). For some years, the closest school for the children living in Roberts Creek was in Gibsons. However, in 1919, two schools were built, one near the present junction of Lockyer Road and Highway 101 and one near Orange Road and Highway 101. Under-aged children were enrolled to fill the quota of six students needed in each school to qualify for government funding. These two small schools were also used by the community for social events, but as the population increased they became inadequate. In 1934, the community cooperated in building the Roberts Creek Community Hall on land donated by John Roberts. All the materials and labour were also donated. The Hall is still in constant use and recently received a facelift and structural reinforcement, again mostly by volunteer labour and donations.